As the record breaking 250th anniversary year of Tattersalls comes to an end, here is another opportunity to view the full 13 minute commemorative film produced to celebrate the illustrious history of the world’s oldest firm of thoroughbred auctioneers. Appropriately, 250 years after Richard Tattersall founded the company that has proudly carried his name since 1766, Tattersalls achieved record annual turnover in 2016. In total, precisely 6,000 thoroughbreds went through the famous sale ring at Park Paddocks in 2016, with 4,929 (82.2%) selling for the record sum of 265,519,379 guineas (£278,795,348), and a record combined average price of 53,869 guineas (£56,562). Europe’s leading bloodstock auctioneers have now achieved record levels of annual turnover and combined average price in three of the last four years. “It is a source of enormous pride to be only the ninth Chairman of Tattersalls in the company’s 250 year history and I am equally proud that the company has marked its anniversary year with unprecedented annual turnover in excess of 265 million guineas and a record combined average price. 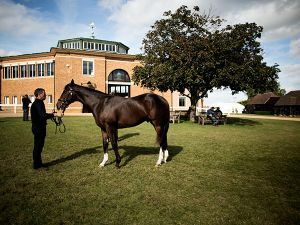 “Tattersalls has been a global hub for the bloodstock industry for a very long time and rarely has this been more apparent than during this historic year. Every 2016 sale at Park Paddocks has seen gains in at least one of the key indicators of average, median, turnover and clearance rate, and the record averages achieved in Books 1, 2 and 3 of the October Yearling Sale stand out as achievements of particular merit. “Individual highlights have included the world’s highest price for a yearling sold at public auction for the fifth consecutive year, more seven figure yearlings than ever before, the highest auction price in Europe for a broodmare, and the highest auction price for a colt foal sold in Europe. In this memorable year the uniquely international appeal of our market leading sales has yet again been emphasised with buyers from every continent and more than 50 countries all playing a part. “Equally importantly, horses sold at Tattersalls have, as ever, performed at the very highest level on the global stage. Group winners in twelve different countries, headed by POSTPONED, currently the highest rated horse trained in Europe, and HIGHLAND REEL, Europe’s leading prize money earner this year, demonstrate why Tattersalls continues to be the venue of choice for so many vendors and purchasers from Britain, Ireland and further afield. “A special year requires special thanks and our gratitude goes not only to all who have played a part in our record breaking anniversary year, but also to all those who have helped make the Tattersalls name synonymous with bloodstock sales and integrity over the past 250 years."